This shade of liquid shirt is a bit more vibrant in person. 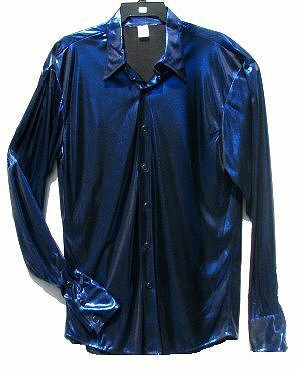 The shirt is made of a thin slinky polyester fabric that is highly reflective and a bit sparkly. The blue and black in the fabric produce a shiny navy blue color that goes great with black pants. or Liquid Joy or Liquid Dove, no Woolite, no Baby Shampoo.. These have very long sleeve lengths. They are 35" and longer. The cuff can be turned up to shorten sleeve length.